Welcome to Paradise Isle Resort! Welcome Home to a Resort with Real Heart and Soul of the South! Welcome home to Paradise Isle Resort. We are a small (34 units), quaint complex located directly across the street from public beach access. The setting here is peaceful and ideal for families and those looking to get away from it all. Since we are a smaller complex, you won’t see the large and loud crowds that you typically see at high rise resorts. Thanks to our wonderful staff we have been able to win the RCI Hospitality Award 4 years in a row. We are continuing to make improvements to our facilities and, in 2016, completely resurfaced the pool and hot tub area, as well as completely rewired the complex for high speed internet and TV in every room (Individual network per room, not shared with the whole complex as lots of other places). 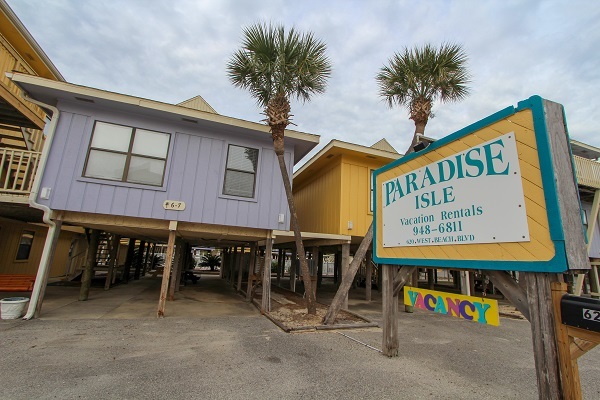 The resort is centrally located in Gulf Shores approximately 3 blocks from the Hangout. We are a short 5 minute drive to Gulf State Park, Orange Beach, Waterville USA, and Alabama Gulf Coast Zoo. There are also numerous places to eat a within 5 minute drive, including Bahama Bobs (just across the street), Original Oyster House, and Hangout, just to name a few. There is even a seafood market 5 minutes away that offers steamed and FRIED seafood to go (S&S Seafood). We offer 3 room types, all with NEW cable TV and High Speed Internet in Every Room. The Small 1 Bedroom sleeps 4, the Large 1 Bedroom sleeps 6, and the 2 Bedroom sleeps 6. Approximately half of our units are Timeshares so if you love it and are interested, see the office manager for a list of units available for sale, as many can be purchased for less than $1,500. Or resort has received the RCI Hospitality Award in 2014, 2015, 2016, and 2017; and the Booking.com award in 2015, 2016! We welcome you to visit and enjoy the Gulf Shores lifestyle with us! © 2016 - 2019 Paradise Isle, Inc.